Strength: Around 8 or so damage. Pretty good durability, around 1200 or so. Details: A fairly cheap sword, easily made after visiting a deep, dark cave for the first time. All it costs is two bones, one gold and two coal. Stength: Around 10 or so damage, only about 900 durability though. Details: A rather cheap addon to an existing gold sword. Simply adding two gold will add much more durability and strength to the sword. It still wears out fairly quickly though, compared to other high-tier swords. Details: This is a miner’s addon to the Boneshadow. 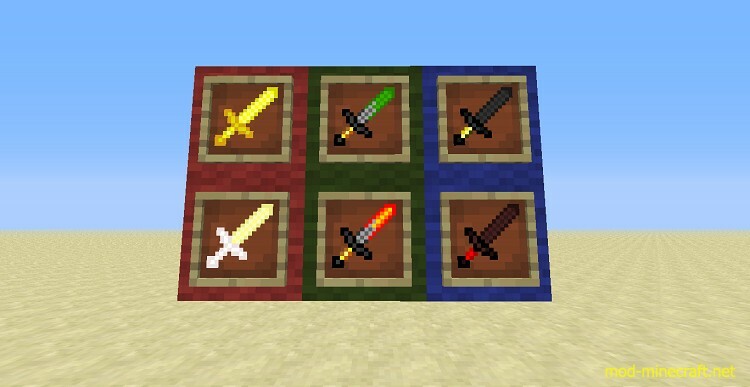 Adding two diamonds, four iron and four redstone into the sword will greatly increase the durability, and increase the strength a bit too. Details: Exactly the same addon materials as the demonic shade, but instead of a journey to the pits of the earth to find redstone this time you need to go to an unlikely location ? The Nether. Don’t worry about blocks, you only need the quartz item for this cheap, but useful addon. It greatly increases the durability too, which is good. Oh and it looks cool too. Not as cool as Demonic Shade’s red tinge but y’know. White. If you downloaded the zip, go inside and take the .jar out of it. Put the .jar you either downloaded from my mediafire, or the side of the page, into your mods file after installing forge.